February | 2015 | Frank & Donnis Travel Blog "the more we see the more there is to see"
We had a busy day with medical appointments. Donnis had acupuncture at Robina then it was a quick drive back to Runaway Bay where I had x-Rays on my suspected broken toe. (two weeks of constant pain) then after a quick lunch we drove to another appointment for Donnis. Cyclone MARCIA , category 2, has formed off the coast a few hundred Klms north east of Mackay. The predicted track will bring it across the coast at Yeppoon near Rockhampton. Heavy rain, strong winds and huge seas are predicted as far south as Ballina on the NSW north coast. Cyclone MARCIA is heading down the coast and expected to cross near St Lawrence (about 800 Klms to our north) early Friday morning. It is currently a category 3 but may be a category 4 when it crosses the coast. We are affected in that we will have stronger than normal winds, higher tides, huge seas and predicted 300mm or greater rainfall. In the afternoon we drove to the spit to see the wild seas and as we walked along the breakwater were bombarded by wind- blown sand. Back at the car we found our legs were caked in fine powdery sand. 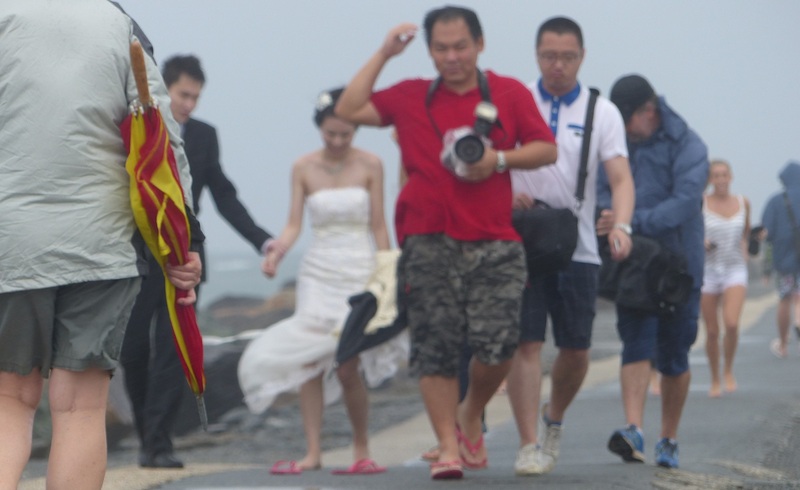 While in the middle of the wet, windy, sand blasting conditions we were surprised to encounter a Japanese wedding party having their wedding photos taken. Wow! What a memorable set of photos they will have! Sorry. Out of focus wedding on the breakwater in driving wind and rain. On the beach below the breakwater was a television news crew trying to conduct a weather report. Trying to carry out a TV weather report in the midst of wind driven sand and rain. 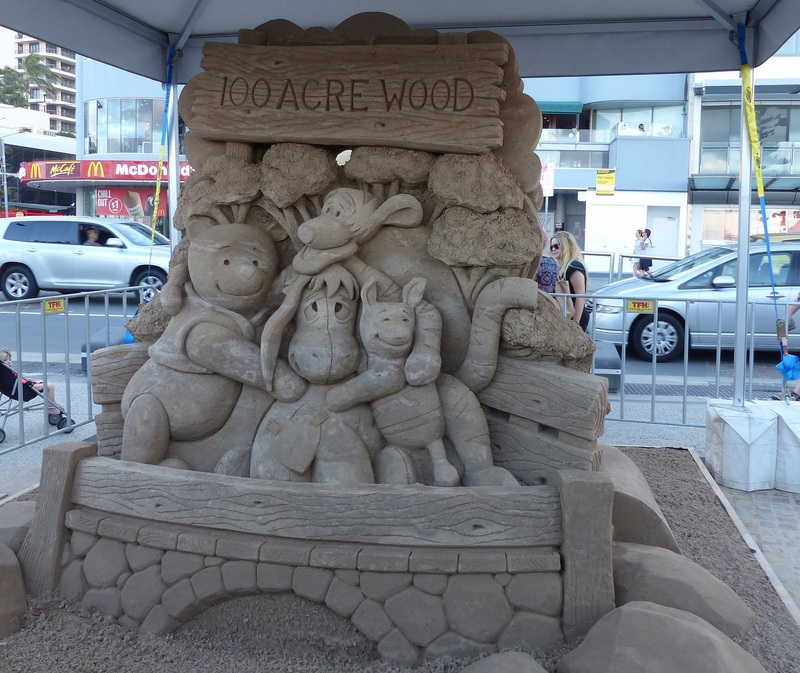 Note the smooth carpet like appearance of the sand. Not a footprint anywhere. We expect the heavy rain predicted for tomorrows will keep us indoors. On waking this morning it was too wet to have my daily bike ride. Instead I turned on the TV. MARCIA has formed into a category 5 cyclone, the highest most destructive level. Yeppoon directly in the path has been evacuated or moved to cyclone shelters which have gone into lockdown. The cyclone crossed the coast at Shoalwater Bay a less populated area than Yeppoon. By the time MARCIA reached Yeppoon it was a category 4. That was still enough to cause widespread damage and the rain created floods wide and far. MARCIA tracked land along the coast, losing intensity as it moved. 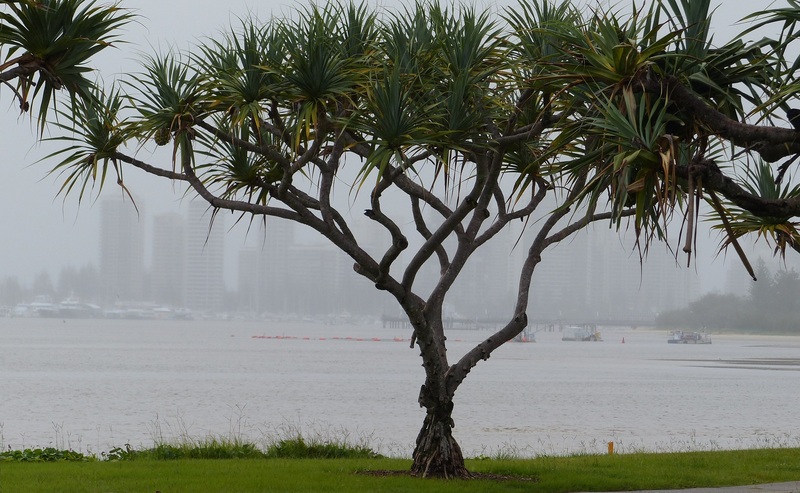 It was downgraded to a rain depression just north of Brisbane. We spent the wild wet day indoors watching continuous reports of the cyclone and the human stories of fear and courage. Another day spent indoors staying dry from the constant rain. The rain eased to showers, on and off, all day. In the morning I managed to ride to Southport but got caught in a downpour. 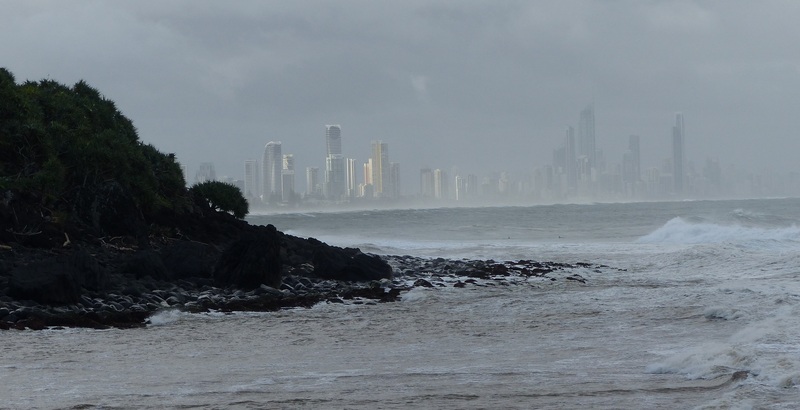 Yeppoon, Surfers Paradise from Labrador parklands with the rain scooting across the Broadwater. In the afternoon we drove to Burleigh Heads to watch the seas which had been whipped into a brown foam. 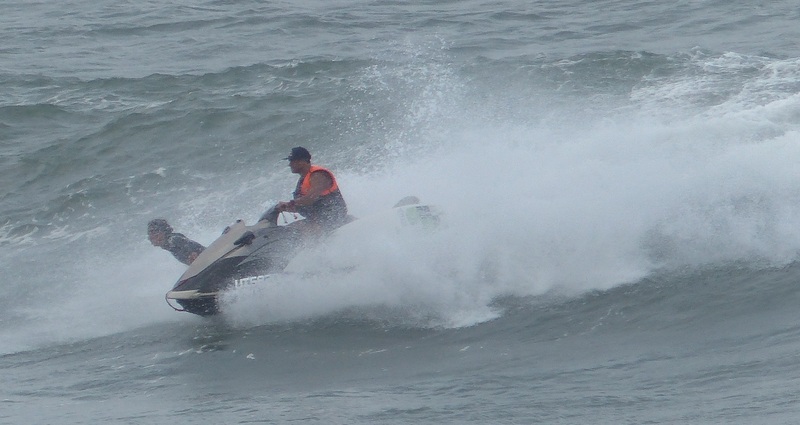 Experienced surfers were being towed by jet skis out to and onto the waves. 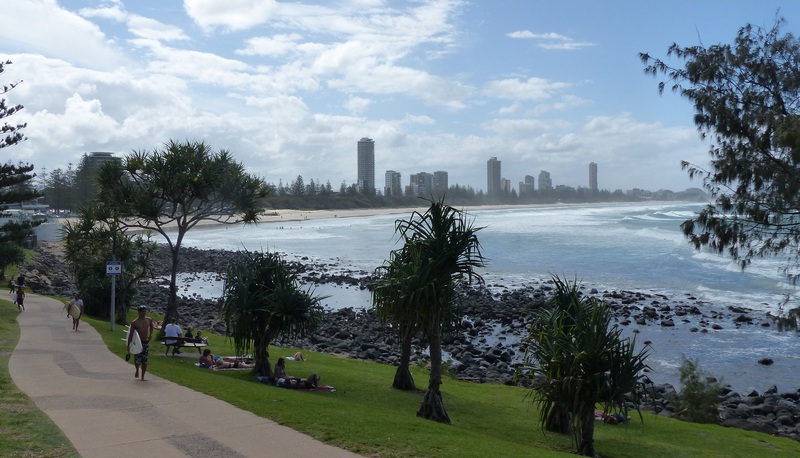 Burleigh Heads and Surfers Paradise from Burleigh headland. Syurfer waiting for a wave. Surfers and jet skis on whipped surf. Surfer being launched by a jet ski. 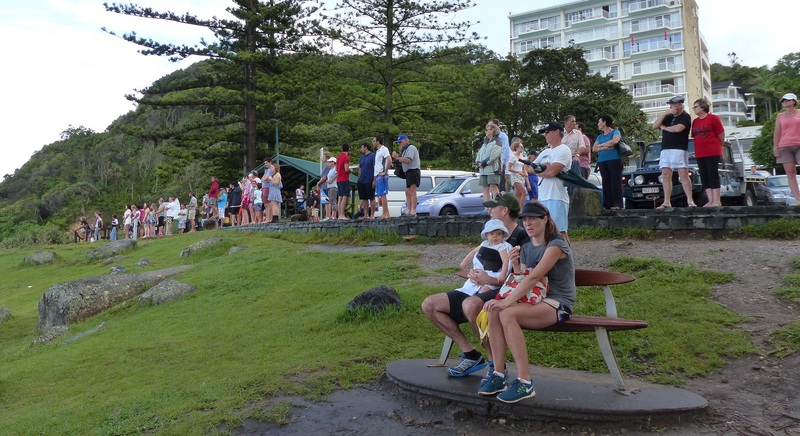 The headland was populated by spectators braving the weather and scattering when a downpour arrived. The conditions were simply too rough for any but very experienced surfers. 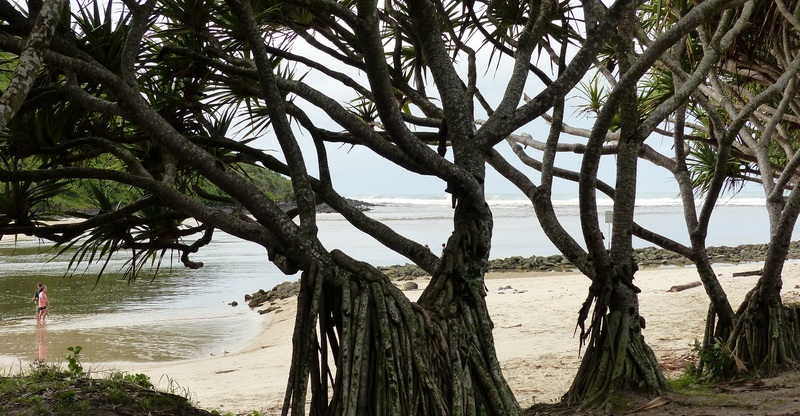 Next we drove Tallebudgera Creek on the south side of Burleigh Heads. Surfers Paradise seen from Tallebudgera Creek. On our way home we stopped at the Charis Fish markets at Labrador and bought fish n chips for dinner. This fish market is very popular and has a huge range of fish. It also seems to be on the tourist bus route as it is always crowded. Today we had insulation batts installed in our ceiling. Anybody who has ever had anything to do with installing said batts will know it is a totally unpleasant job. That is the reason I was not doing the job myself. As well I have heard too many horror stories of batts being installed over electrical fittings, causing a short and ending with a house being destroyed by fire. Added to that were the deaths of four installers a few years ago stapling insulation in place and being electrocuted. Our house is steel framed adding to the concerns of electrical problems. Of course it was a hot sunny day and the man doing the installation was alone, his assistant was away suffering from bereavement leave of a funeral last week for the death of a friend’s young baby. I was a bit anxious all the time the man was in the ceiling cavity and grateful when he completed the task and he was in one piece and healthy although he had lost some weight due to heavy perspiration. The house seems cooler today although by midday it was overcast and we had some showers. It felt cooler as we walked into the house from outside. Saturday 14th February – Valentines Day. Hmmm! What romantic things did we do today? to take with us as we were visiting Peter, Regelyn and Chris. On arrival we discovered the cake, which was lovingly placed in a wicker basket with a cloth around it was left on a chair on our verandah. After a week of doing much other than things which needed doing around the house I was being to feel house bound. We had to get out of the house. 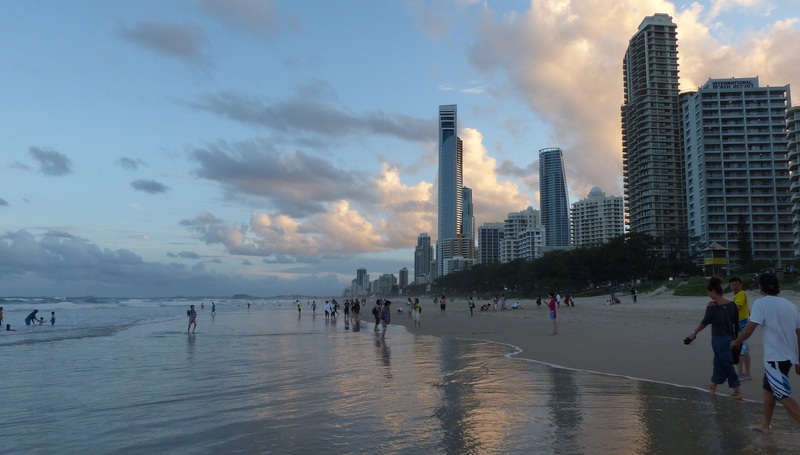 The Gold Coast always has a program of activities almost every week and especially on weekends. 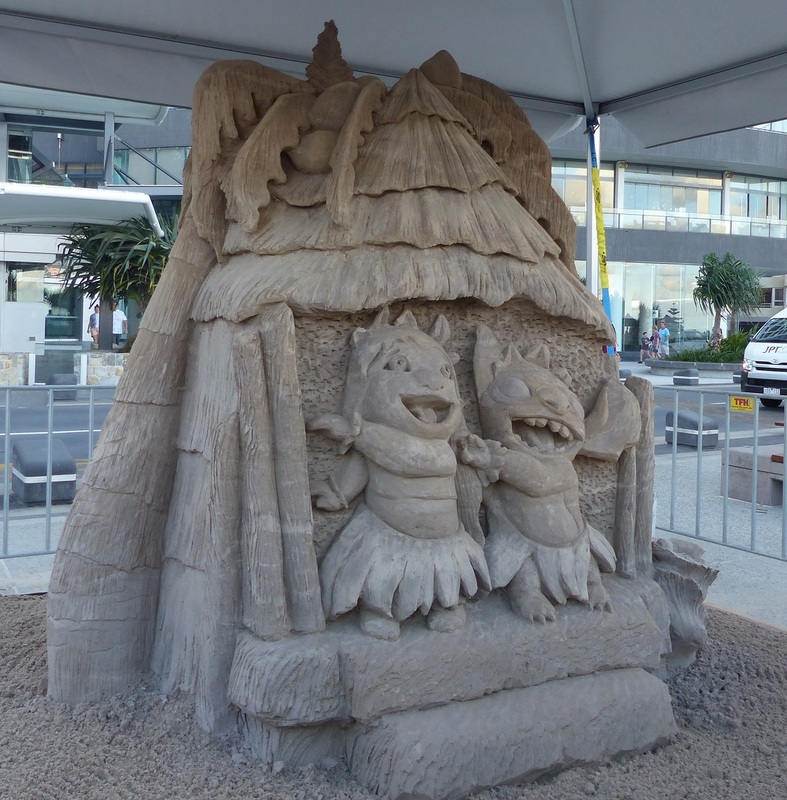 This week there was a sand sculpture competition in progress and we thought it might be interesting to have a look late in the afternoon. 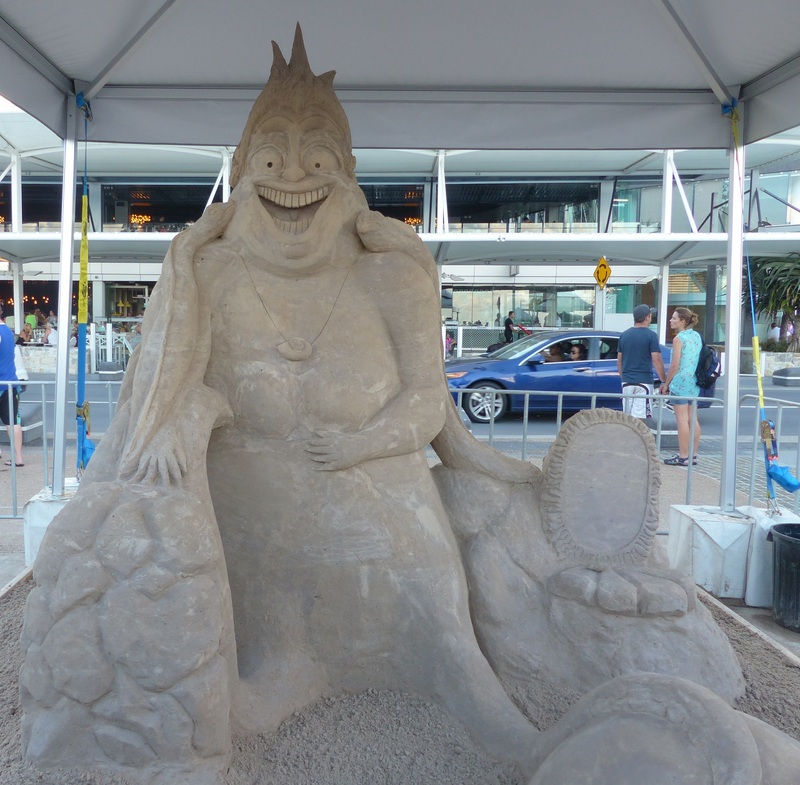 Imagine our surprise to find that upon arrival at Surfers Paradise the traffic was crawling along the esplanade and most of them, like us, was looking for a parking spot. Then came the obstacle course of walking along the path along with thousands of other people all stopping to look at the sand sculptures and or the markets which were still in full swing this late in the afternoon. We then walked back along the beach paddling in the waves as they slid up on the shore. How can I convey the wonderful feeling of being on the beach, sand between my toes, water lapping my legs and breathing the salt laden air. We must do this more often. 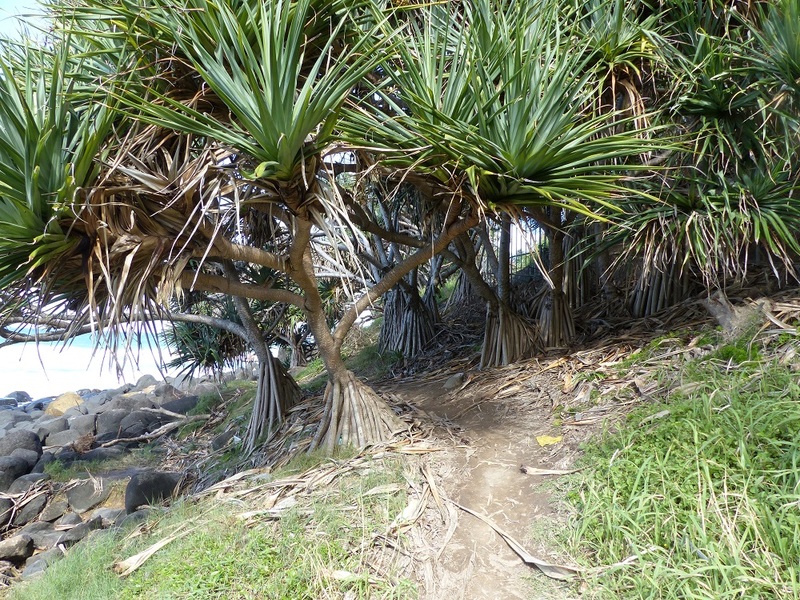 Burleigh Heads National Park walking track was closed due to a bushfire late last year followed by a landslide after heavy rain. Surfer made their own muddy path to a launch site on the rock headland. Surfers had to brave a few obstacles in order to launch themselves into the surf then try to paddle against the waves without being washed back onto the rocks. 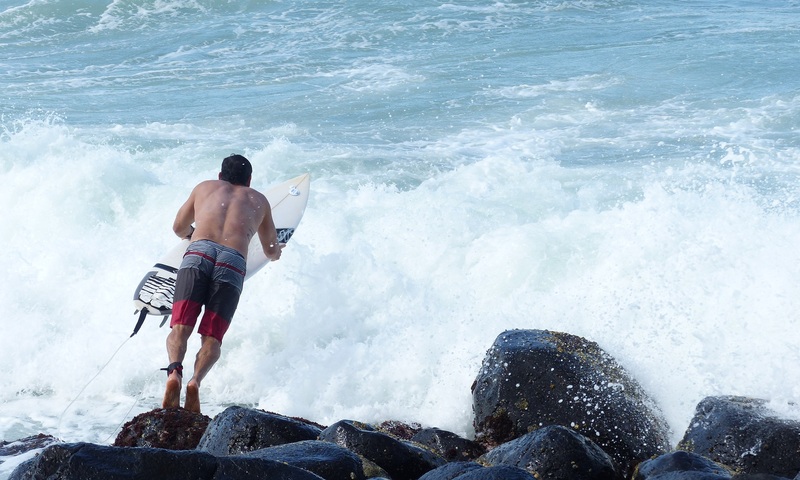 Big waves require big courage. Surfers Paradise from Burleigh Heads. On Monday I put my laptop into the repairman. I needed the keyboard replaced, Windows re-installed as a 64 Bit instead of the 32 Bit which it was previously running. It was running slow. As part of the process of re-installing windows I lose all my other programs and data so everything has to be backed up from scratch. OK I can live with that. However, I had been caught before and was caught again. When Windows is re-installed it does not include all the updates over the last 5 years. As well the re-installation re-sets my preferences. The preference which I conveniently forgot was that Windows would do automatic updates not the option to find updates and let me choose which ones I want. As soon as I connected to the internet Windows jumped in and did the updates. It used up 9.5Gb of download and my monthly allowance is only 8Gb! All my internet usage was gobbled up in one transaction. Also some of my more recent photos and word documents just seemed to disappear. Especially items which I created AFTER the laptop was returned to me. Donnis arrived home after an epic 12 hour drive. She took more and longer rest breaks but was still rather tired when she arrived. It is hard to settle down and relax after driving and concentrating all those hours. She was was hyper active but could not stay still long enough to even watch the news on TV. After a shower and dinner she went to bed. 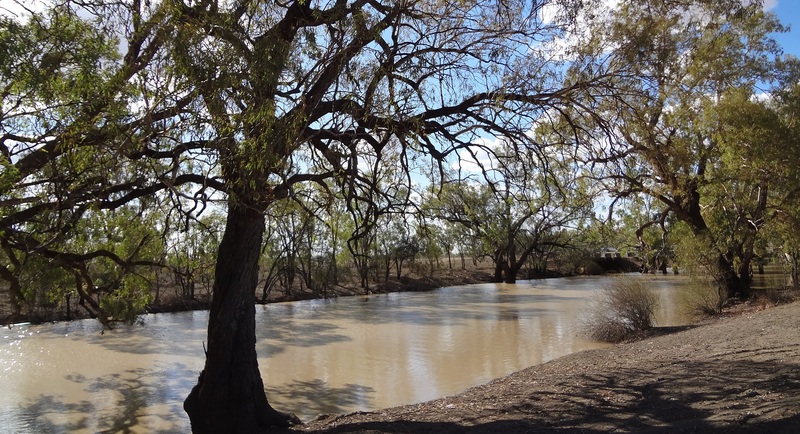 After a breakfast of blueberry pancakes we looked at Donnis photos of her view of Lightning Ridge and Goodooga before she went back to bed. Telstra have agreed to top up my 8Gb of download for free but so far 24 hours later it has still not happened. In the afternoon Telstra finally got my download speed back to normal and promise me it will stay that way. 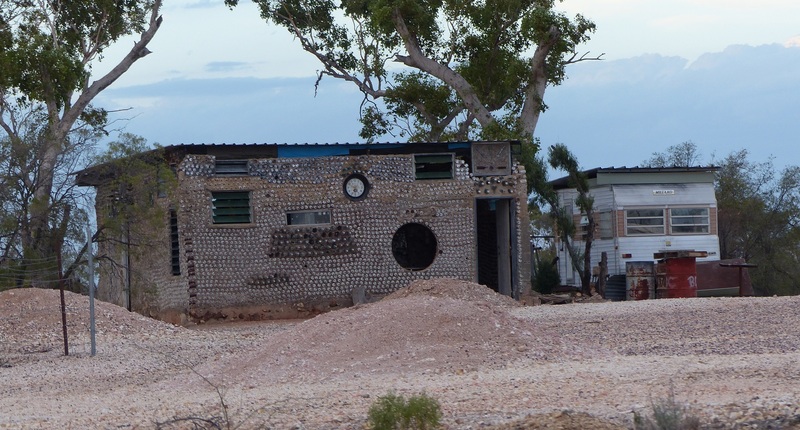 A house made of beer cans, bottles and a form of mud bricks. 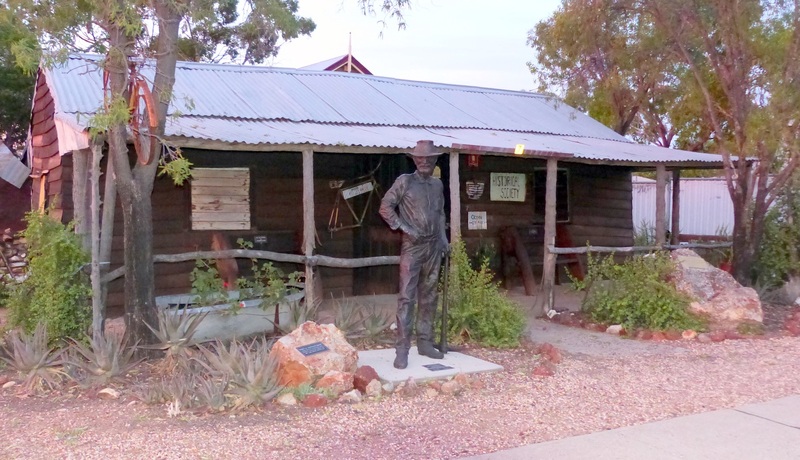 The house was built in 1977 at the loneliest site at Lightning Ridge – the original shaft area. Julie photographs Mick, another nurse friend, through a window of the beer can house. Back in 1977 when this house was built beer cans were mostly steel, not aluminium as we know them now. Those older style cans have rusted in position in the wall. The coloured bottles used in parts of the wall are still as vibrant as when they were first used. 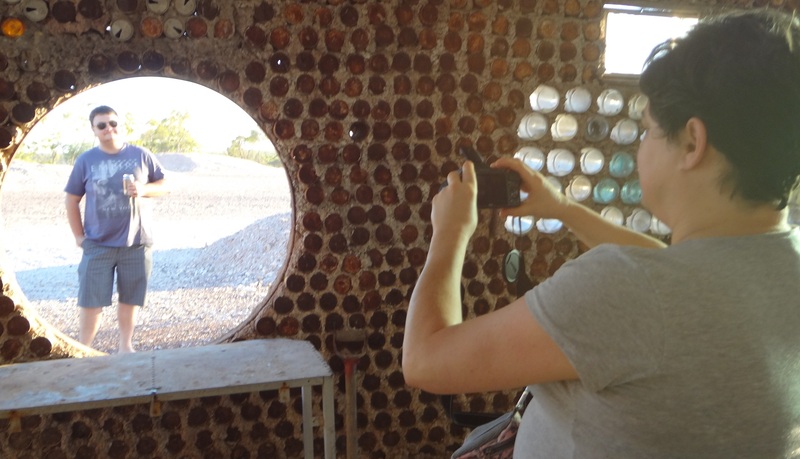 Julie photographs the sunset at the first shaft at Lightning Ridge. The mostly dry Bukhara River comes alive after one good storm. 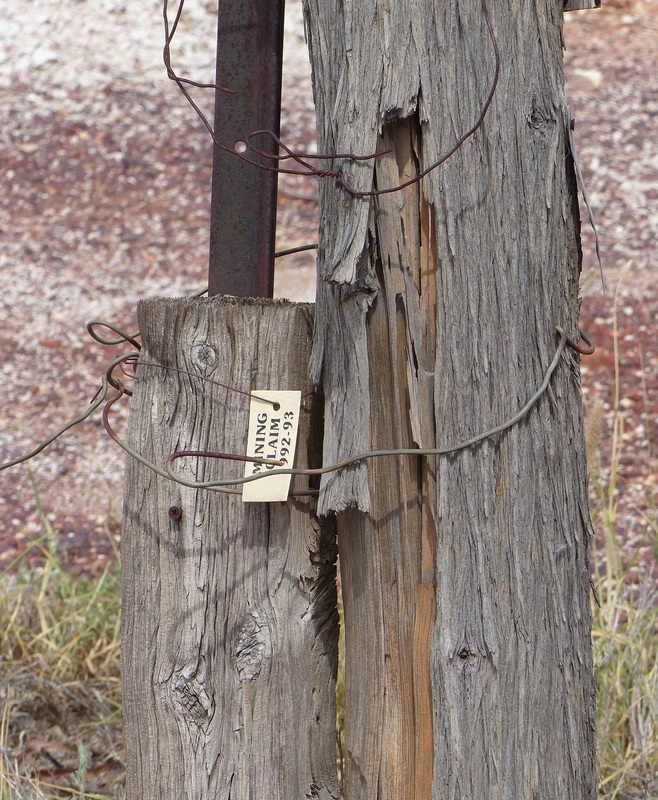 Old buildings and signposts at Goodooga an Aboriginal settlement about 60 Klms north of Lightning Ridge. Look closely and you can see a faded mural on the wall. 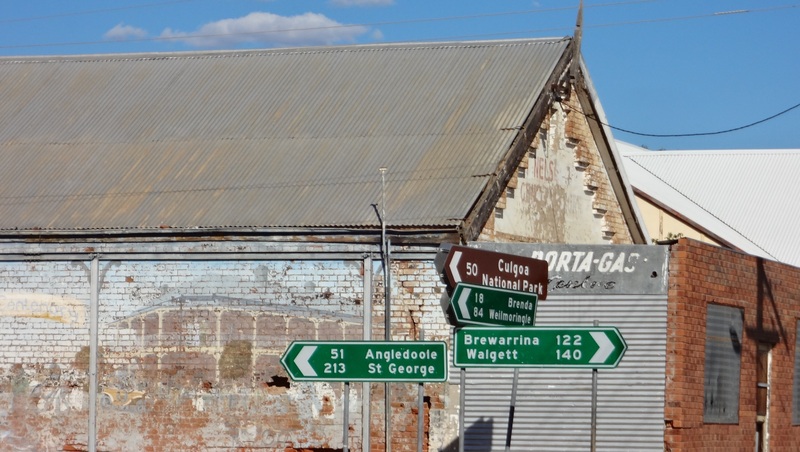 The mural depicts what appears to be an outback style hotel and the word centenary and what appears to be drovers moving a herd of cattle. Old petrol pumps at Goodooga. 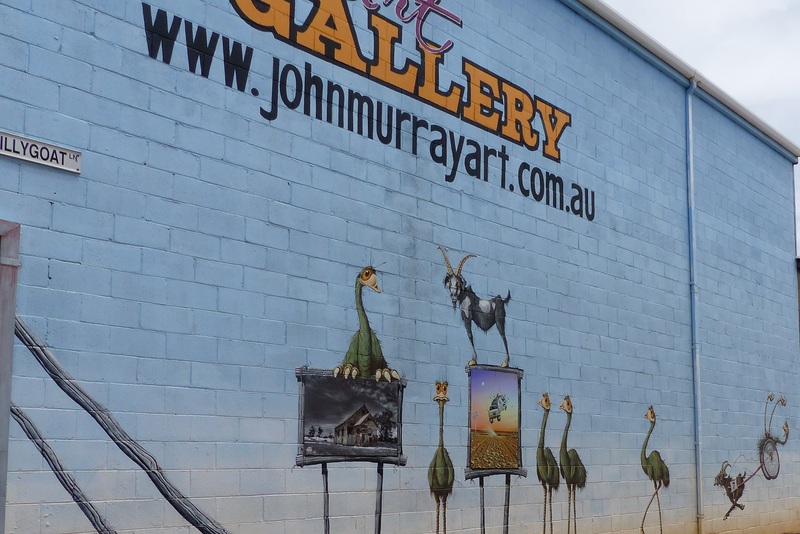 John Murray Art Gallery. 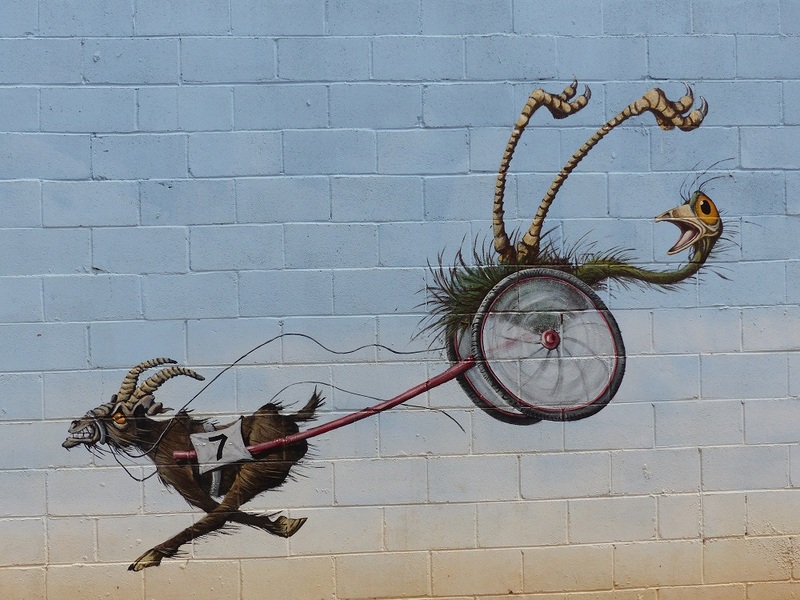 These images were painted by him on the wall outside in Billygoat Alley. 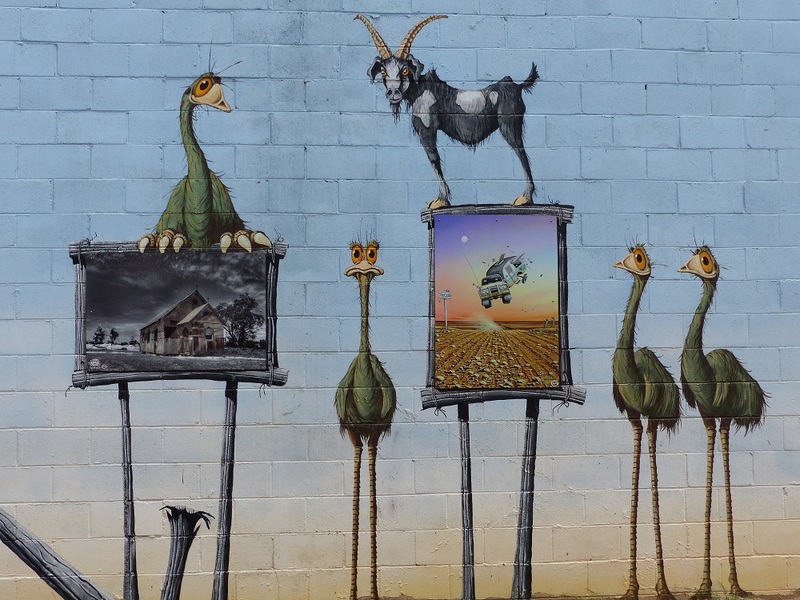 Note the Billy Goat shown in the paintings. An old original miners hut now a historical society museum. The statue is of Charles Waterhouse Nettleton. 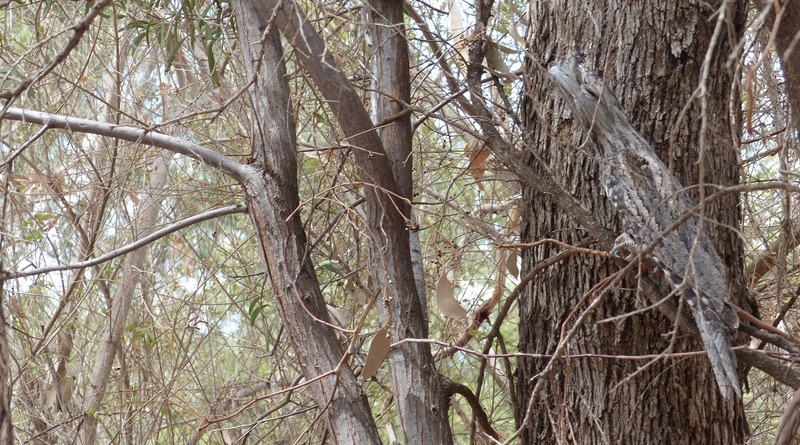 This Tawny Frogmouth is well camouflaged in the tree. Last night we went to the bore baths after Donnis finished her shift late. A grade one emergency had occurred due to an accident on a property way out of town. A man on a quad bike was badly injured. We arrived when only two other people were at the pool. They left soon after we arrived and we had the place to ourselves for awhile. Then a ute with three people and several dogs arrived. 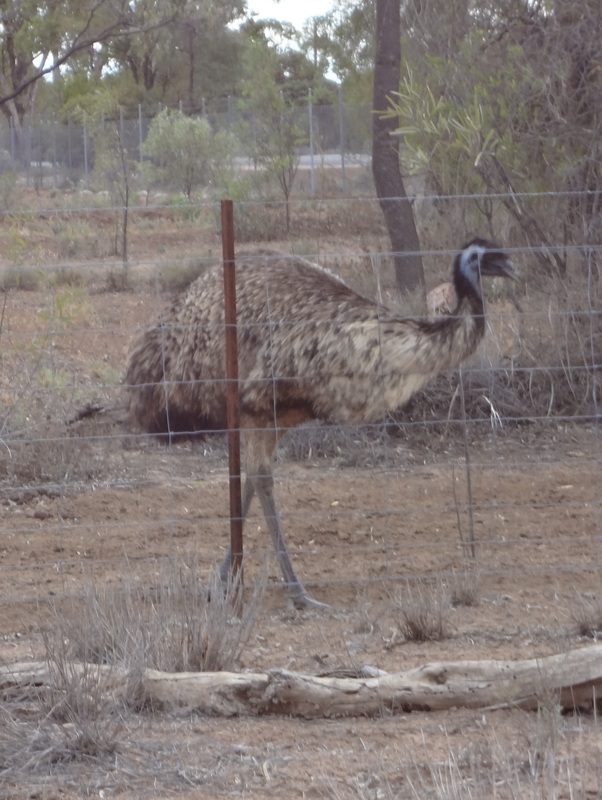 They were wild pig hunters travelling the back territory of western NSW and had just arrived in town after a long day searching for wild pig in the back blocks of the Brewarrina district. One of the two men was carrying a large hunting knife in a scabbard on his belt. They had arrived with no drinking water and were hoping to find something to drink at the pool. At midnight they would not find anywhere in town to purchase water until tomorrow. After checking the heat of the water with their hands they decided not to enter the water. Another trio arrived who were also visitors and too cautious to enter the water. Another couple arrived and it was time for us to say goodnight as sleep was knocking at our heads. Woke late…8am… and the temperature was already 26° with not a cloud in sight. I found this poem, in, of all places, the New South Wales Government Website, Mining & Energy when I was researching information about Western Land Leases, Mining Leases and Mining / Fossiking Permits. 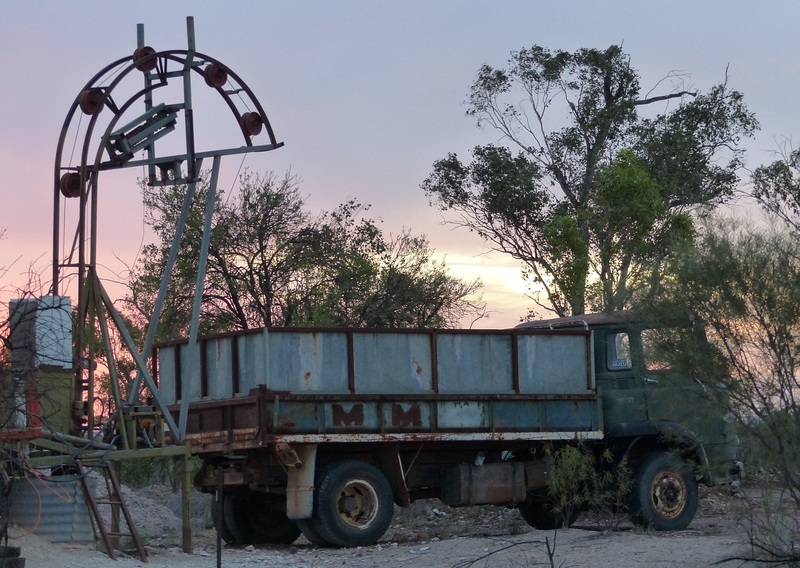 Lightning Ridge, the town of opal, where there’s heat and scanty rains. Nature sired her scenes of beauty, in black opal, underground. Like quicksilver gaily coloured, slipped through the shades of night. There are scenes you’ve never dreamed of, in the stone of mystery. Michael returned from his weekend of exile on relief duty at Goodooga Indigenous Settlement Hospital. The Aged Care section of LR hospital has 20 beds and all are occupied and in fact has a waiting list. The hospital put on an Australia Day barbecue luncheon for the residents so the three of us joined the residents, other nurses and staff for a beer and a steak. I met the man in charge of hospital security and asked him how he came to be here and when. It seems he was living in Melbourne and felt life was getting beyond him. He resolved to travel to LR and sit in the Hot Bore Baths and think about his future. He saw a job advertised for security staff at the hospital and applied. That was 13 years ago and he has no plans to leave. I met a man in a wheelchair who had his legs removed due to diabetes. Then there were the four nurses, all from India. All have been here 2 years and love the town the lifestyle and their work. Back to my research. Although the concept of a mining lease may have a certain romanticism about it, the reality is a lot different. Just to obtain a lease and mining permit and permit to build a dwelling can cost thousands of dollars per year. There is no guarantee you will find opal and things such as equipment, building materials, power, water, waste disposal and food supplies have to be mostly trucked in. Or at least purchased locally and hauled to your lease. The lease boundaries must be marked and not encroach on other leases. All this before you even turn a sod of soil. It takes a certain type of person prepared to put up with red tape and hardship for the chance to make their fortune. A lonely miners house near the first shaft. This house is built from mud and aluminium cans. Anothyer miners house in the lonely original ridge. Note much of the house is constructed from local rock and the roof is various types of roofing material held down by more rocks. The local newspaper announced a man was missing. 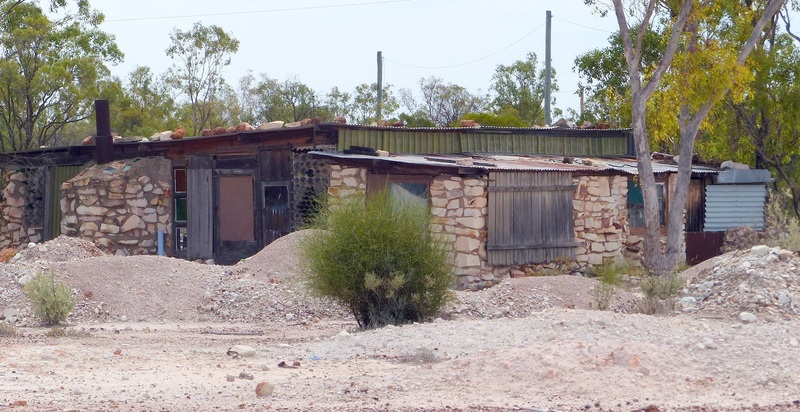 His car, wallet and possessions were all intact and no signs of a struggle at his residence in a mining camp. Locals have speculated he could be at the bottom of an open shaft (which was the first thing I thought of too) either accidentally or otherwise. 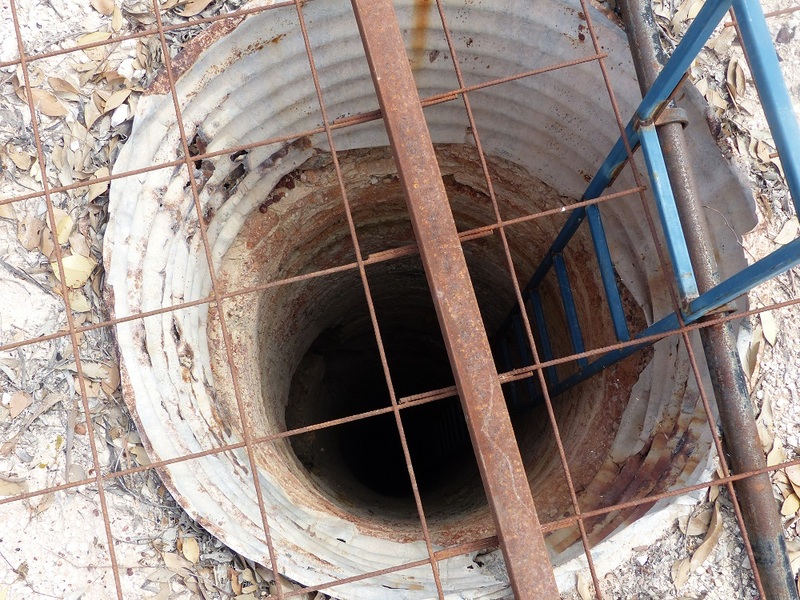 After wandering around on just a small part of the claims and noting the hundreds of open shafts with little or no attempt to cover them I can imagine how easy it would be to fall into a shaft in the dark. One of thousands of open shaft. This one is unusual in that it has a far better safety grille in place. Most shafts do not. After dinner I went to the site of the first recorded shaft which is unusual in that it has a fence around it and a plaque on a rock with a steel grille over the shaft. 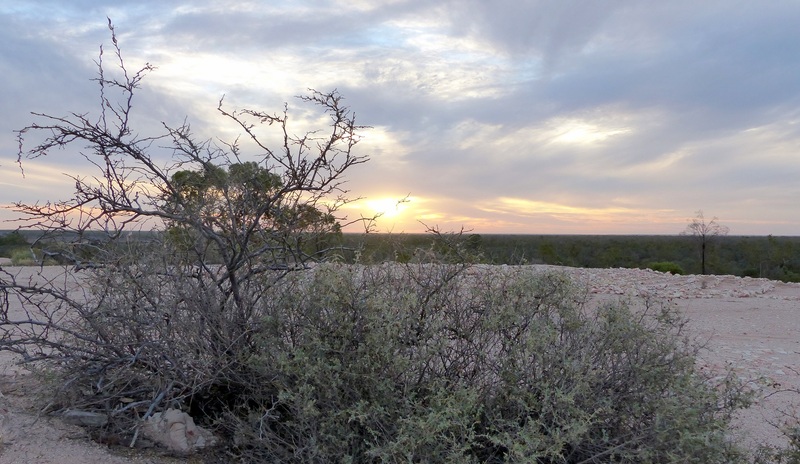 This area is the original ridge, the highest point in a vast flat plain. As far as the eye can see this is flat land with a few small ridges, the remnants of a once vast inland sea. Locals and visitors come here for the sunsets but tonight I was the only lonely visitor in a lonely place. 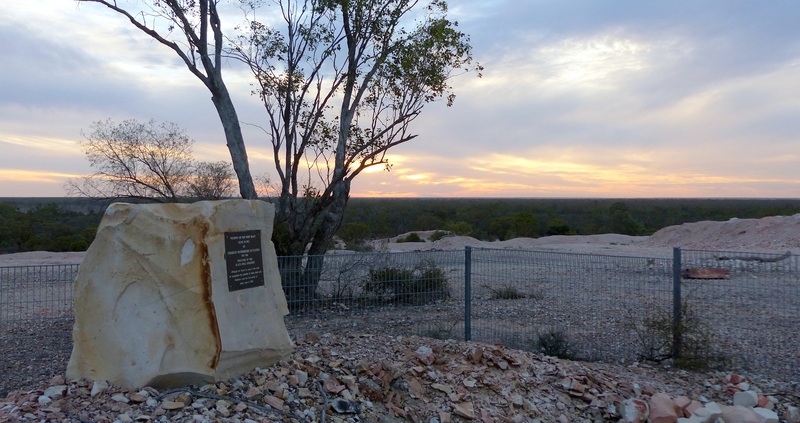 The beginning of sunset from the original “ridge” site of the first shaft sunk in 1902 and from where the first miner, Charles Waterhouse Nettleton sold his first black opal in 1903. Suinset from the ridge. Notice the maze of stones. 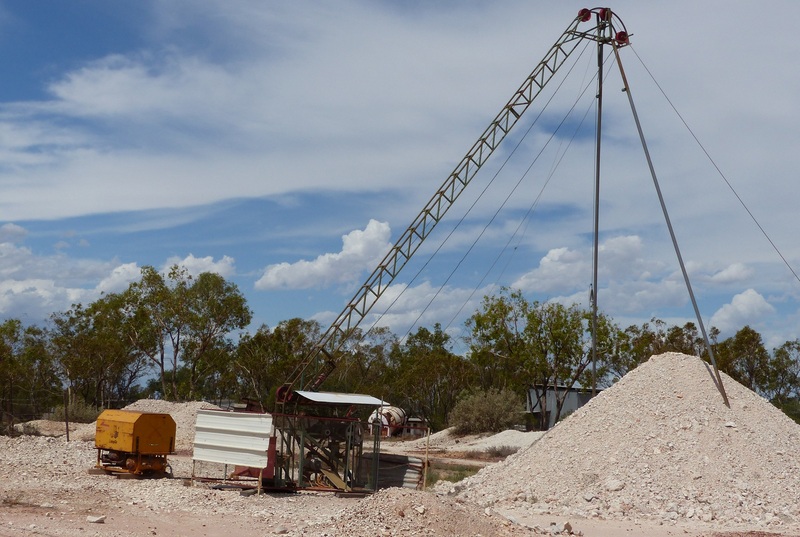 This is a large hoist to bring up “bucket” loads of material dug from the shaft and galleries far below.Later the miners will trawl through this mullock heap looking for colour (opal) which they may have missed while underground. A smaller hoist in silhouette on the First Shaft Ridge. 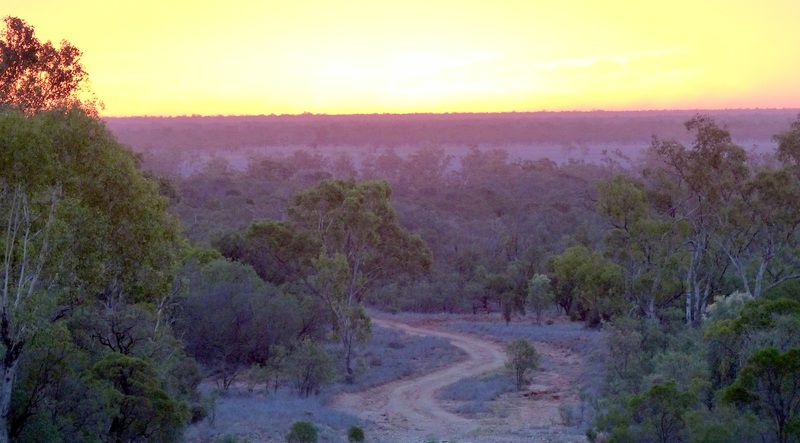 The sun is sinking fast and highlights the twisting red earth road disappearing in the gloom. 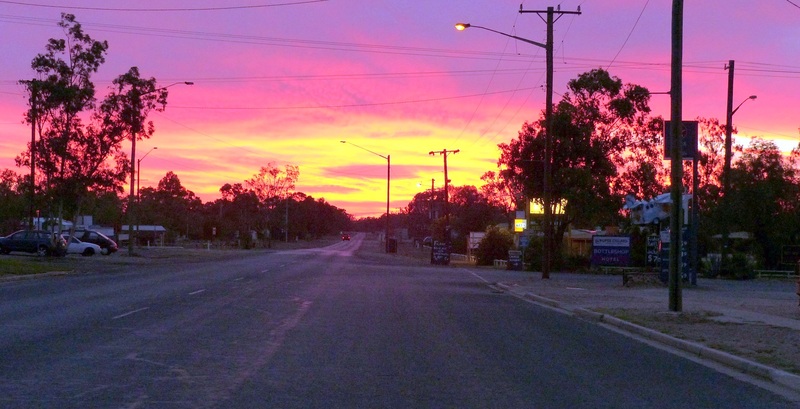 This is sunset from the main road of Lightning Ridge. At midnight Donnis, Michael and I went to the Hot Bore Baths. Today was the long drive home to the Gold Coast. Nine hours of bouncing along in TERIOS. I had a lot of time to ponder a few thoughts. One ponder was about the cost of fuel. When I left home the cost of a litre of E10 unleaded fuel was $1.05.9 and expected to fall below $1 within a week. Fuel is cheaper in NSW so I expected prices below $1 already. 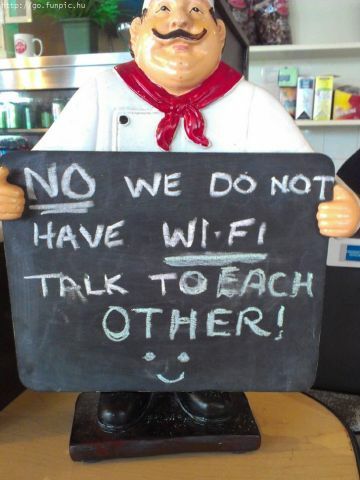 WOT THE!. Fuel in the NSW town of Lismore was $1.24.9 and at a discount outlet in the small town of Casino it was $1.21.9. In Armidale it was $1.24.9. 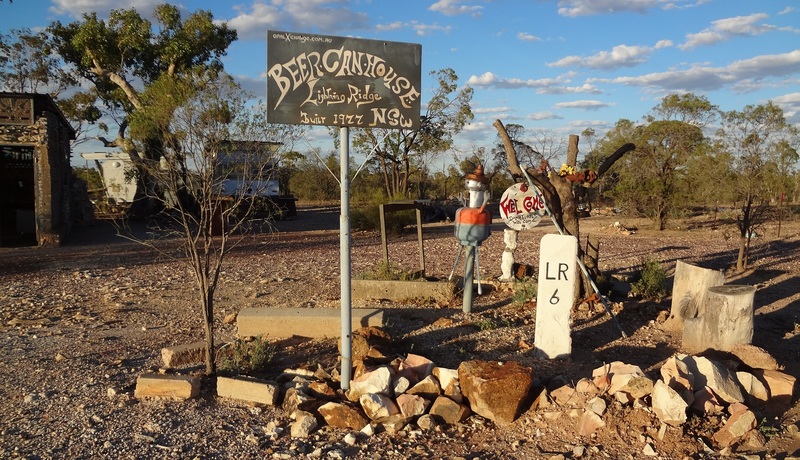 In near western NSW at Moree it was $1.25.9 but at remote Lightning Ridge it was $1.24.9. On my drive from Moree north, fuel was $1.30.9 at Boggabrilla on the border and at Goondiwindi just over the border I fueled up at $1.31.9! Heading east towards the coast I saw fuel prices at $1.41.9 and it was not until I was near the coast that I saw prices of around $1 per litre. Fuel prices do not make sense. It was a tiring trip especially as TERIOS is not equipped with seat options to raise or lower the seat or adjust the lumbar tension. I was constantly wriggling and trying to ease the discomfort in my back. Highlight of the trip was Cunninghams Gap a notorious mountain pass near Ipswich which connects with the coastal plains near Brisbane. Trucks must use low gear and I found myself in a long line of cars slowly snaking their way down the pass. After I arrived home, absolutely worn out I caught sight of myself in the mirror. Those red rimmed eyes explains why they felt so gritty and why I felt so tired. Despite feeling tired and ready for bed, sleep was eluding me. I had reached the point of being over tired. Hmmm! Just a little more information on the missing man. The Police have set up a Facebook page about the missing man and are asking for information. Some of the comments are complaining that not enough is being done to find him. Of course none of the whingers have actually assisted in a search party. One of the posters is a woman who claims to be his “missus” and she is missing him. A link to her Facebook page shows that the missing man, Ben, was involved in a fight in late November and she is saying he is lucky not to have suffered greater injuries and she blames him for what happened. Hmmm! Perhaps the altercation only about 6 weeks before is linked to his disappearance? I spent most of the day doing light duties around the house and just relaxing. However I did go a bit crazy in the afternoon and cooked a Salmon Mornay, a Cauliflower Au Gratin and Turnip Chips for dinner. Now I have leftovers for another two meals although to be honest it took a bit of will power not to eat all the cauliflower in one sitting. I have been riding the bike every morning. Today I rode on a bike track at Runaway Bay about 3 Klms from home. The track is a 1.5Klm long, is wide and has inclines designed to test riders. I managed two circuits by which time my leg muscles were burning and I still had to ride home. In the afternoon a heavy duty storm arrived, seemingly from nowhere and not at all predicted. Lightning seemed to strike in the street outside and rain began to lash the buildings. Too late I tried to close all windows and doors but started on the wrong side of the house. The bed was wet as was the floor in the downstairs room. The rain continued to slam against the house as I mopped up with an armful of towels. Had an early acupuncturist appointment. The treatment yesterday seemed to ease the pain and discomfort. Maybe today’s treatment will give me a comfortable nights sleep and no pain when I turn my head. Then I had coffee at home and baked a coconut berry slice. What to do with the rest of my day? Go to Sea World. – Lots of families will be there. Crowded. 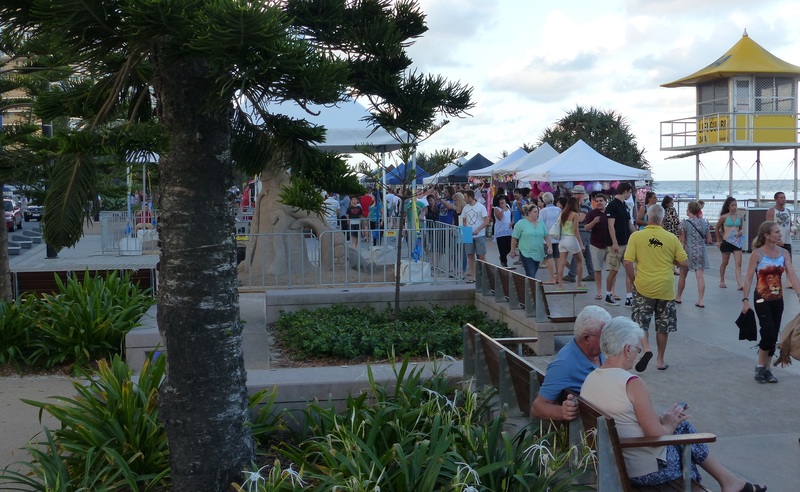 Go to Burleigh Heads National Park.- Again lots of families and of course parking problems. 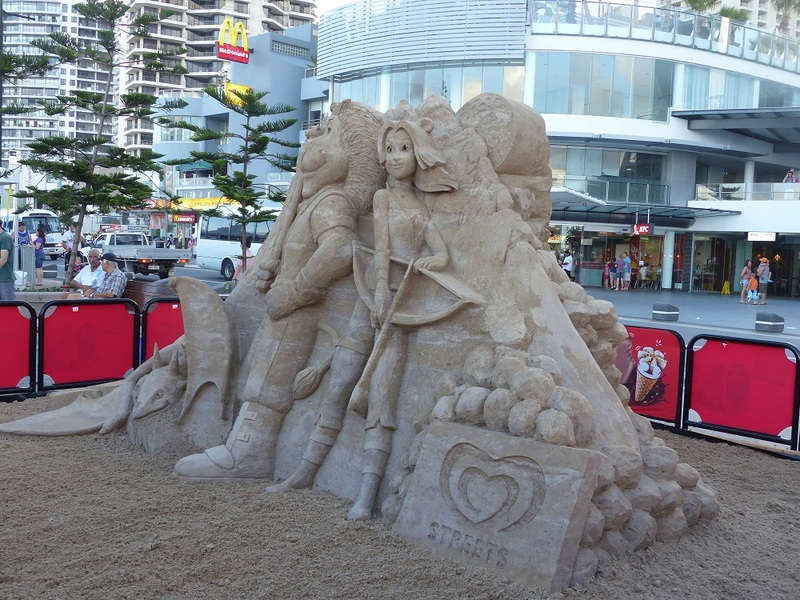 Go to the Travel Expo at Broadbeach. Lots of people but I can catch the bus and then the new Light Rail which has a station right outside the doors to the Convention Centre. I have been wanting to travel on the Light Rail since we arrived on the Gold Coast. I tossed a coin and went to the Travel Expo. So did many other people but at least I had no parking problems. I noticed as I stepped off the tram there was a sign to say the car park was full. Spent a couple of hours wandering around and looking at possible travel destinations and travel modes.